What’s the most exciting project you’ve worked on to date? As an Assistant Project Manager in BOND’s Civil & Utility Division, I work on a lot of infrastructure projects. My current project is the Western Avenue Utility Crossing and Roadway Realignment. It’s one of my most exciting projects so far. We are building a cast in place utility tunnel for Harvard University’s expansion into Allston across Western Avenue. We are constructing a new road that traffic will be rerouted to while we tunnel across the road. It’s a multi-faceted job, requiring a lot of pieces to fall into place to meet tight schedules. Daily, we use our creativity to come up with alternative options to design, meet schedule restraints and put together logistics plans. This allows me to use the design skills I obtained through my bachelor’s degree in architecture at Wentworth Institute of Technology. What challenges have you experienced working as a woman in the construction industry? One of the biggest challenges is the assumption that men in the industry have more field experience and knowledge. It can be intimidating to go onto a job site at first with a new project team. It takes time to build relationships with the team and subcontractors in the field, but once you do it becomes increasingly more comfortable. Over time I have learned to continuously ask questions while on the jobsite, so that I can understand more construction details of the project. What would you like to see change in the future for women in construction? 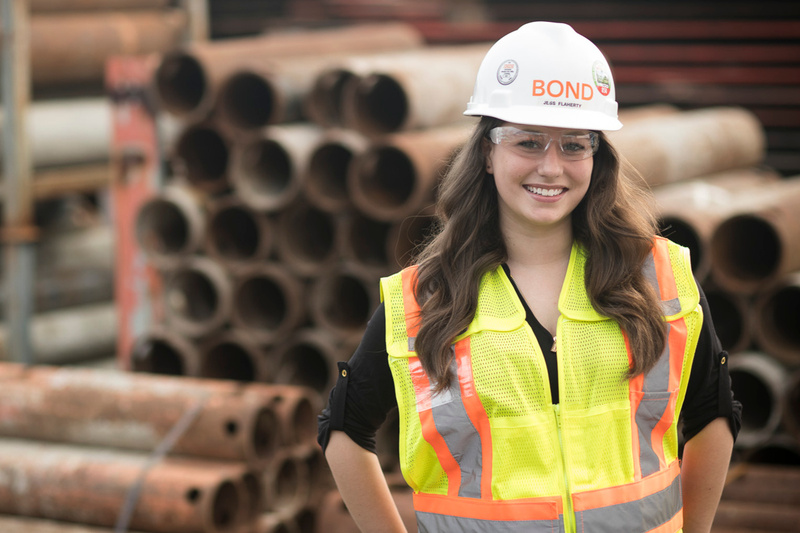 I would like to see more women enter the construction management field, especially in BOND’s Civil & Utility Division. We are currently outnumbered by the men in the industry, and women bring valuable skill sets as well as new perspectives to the workplace. I’d also like to see more women serve as mentors to others in the industry. Mentoring Co-ops and new hires has been one of the most rewarding facets of my career.